With 550 participants from 17 nations competing in 12 sports across multiple venues, 75,000 attendees, and 1,662 volunteers, the Invictus Games Toronto 2017 had a very unique set of event management needs. BCG donated a hosted DisasterLAN (DLAN) Incident Management System to provide all the tools needed for situational awareness, resource management, reporting, and notifications throughout the game and in return were provided Proud Supporter status. Having the support of BCG and their partner FutureShield through the provision of the DLAN System for the Invictus Games was instrumental in the successful operations of the Invictus Games Main Operations Centre. The DLAN system was easy to use and allowed us to track activities and issues across the Games theatre and to communicate with our workforce out at venues, all key in operating a successful Games. - Dena Coward, Chief Operating Officer. BCG and their Canadian partner FutureShield also provided all implementation services and training for the Invictus Game team. 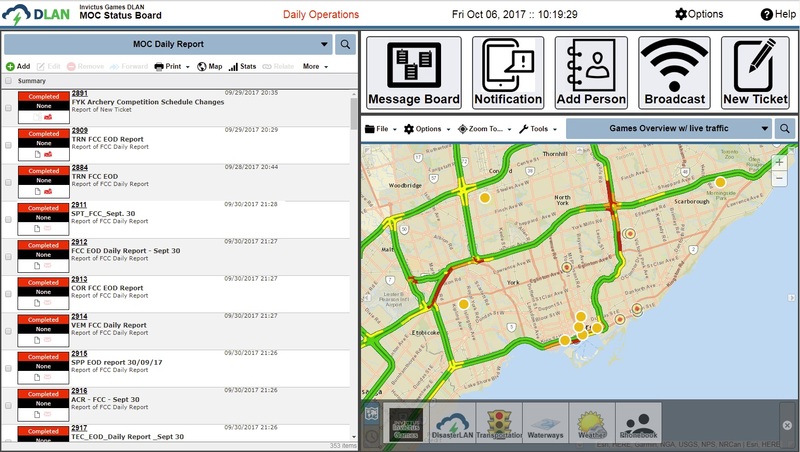 Tools such as DLAN’s Status Boards, and GIS provided visual situational awareness to event coordinators, creating a common operating picture for event management. With DLAN the Invictus Games team was able to monitor potential threats, as well as manage all routine event activities. The system was used for daily venue reporting and notifying volunteers via Email and text messaging. Considering the high profile of both guests and athletes attending the games, Invictus Operations took advantage of privacy features for locking down of sensitive information ensuring that safety could be maintained. FutureShield Inc. was founded in Toronto, Canada in 2005 on the premise that there is a strong need for domain expertise in integrating software solutions for security, emergency management, and critical infrastructure protection.